In 2001 we decided to bet for the stone fruit’s production with a clear idea, differentiate our product. For getting this great objective, we based our production in respecting the environment as much as possible. With an IPM (Integrated Pest Management) and a rational use of phytosanitary´s products. Only in this way, we will be able to offer a secure, harmless and respectful with the environment product for the final consumer. Finca Valleluz is located in a special protection area for birds “Hoces del Río Jalón” for the protection of Aquila fasciata (Bonelli´s eagle). Finca Valleluz S.L. has now 120 hectares of production. 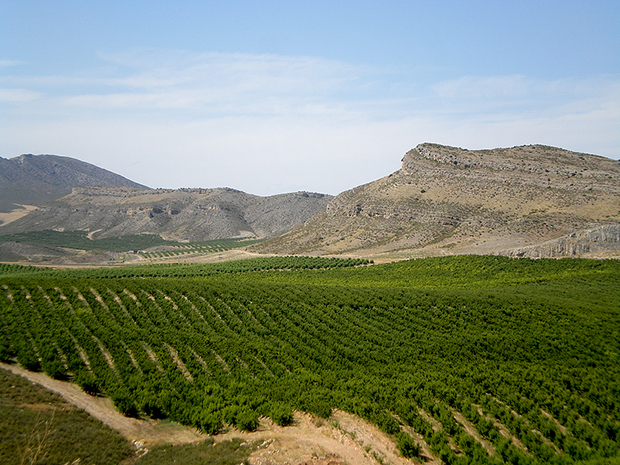 Of which 40 hectares are cherry, 15 are apricot, 15 are flat-peach, 30 hectares are nectarine and 20 hectares are peach. With this surfaces and crops, we start our collection period in early May until late September, when we finish. Every our crops are adaptated varieties to the area with a special commercial interest. The cultural practices developed at Finca Valle Luz for the farming of stone fruit we produce, enhance biodiversity creation, maintaining spontaneous vegetation between our fruit´s lines. Thus we enhance the implantation of numerous animal and vegetal species, at the same time, we stop, significantly, the erosion process that may occur. For our farming´s development we have last generation equipment for fertilizers control and phytosanitary applications, as well as temperature´s control and humidity. Ensuring a rational use of water and other innputs. Finca Valleuz is certified under the food security´s main standards. P.I. Aragón and GlobalGap, and soon, under the new ZERYA´s protocol.